↑ Henley၊ Jon။ "The last days of paradise"၊ The Guardian၊ 11 November 2008။ 12 May 2010 တွင် ပြန်စစ်ပြီး။ "[The Maldives] holds the record for the country with the lowest high point on earth: nowhere on the Maldives does the natural ground level exceed 2.3m. 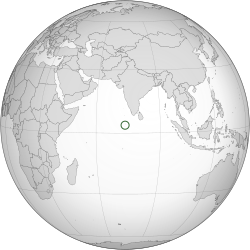 Most of [the Maldives'] land mass, which totals roughly one-fifth of Greater London, is a great deal lower [...], averaging around 1.5m." ↑ Upper middle income World Bank. Retrieved 18 September 2015.